A gift to make tea-lovers rejoice! This gift offers a wide variety of teatime edibles, and an assortment of fragrant teas for brewing. Items are packaged in a lovely handled fabric basket. Includes complimentary scissors for easy opening and arrives decorated with a satin ribbon. 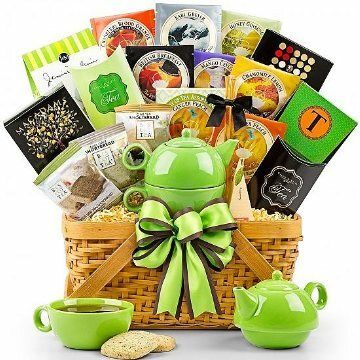 This gift includes the following: Matching ceramic teapot & cup, organic teas in several enticing flavors such as white tea, green tea, black tea, jasmine, and peppermint, assorted gourmet cookie tea accompaniments, green tea caramels. Measures 12" x 9" x 8". Tea Time Basket has been purchased most frequently by our customers for the following occasions - Get Well, and Thinking of You.